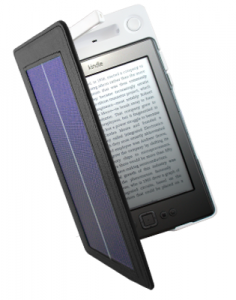 On January 14th, SolarFocus releases the first ever solar powered Kindle cover. It is a form fitting cover with a solar panel included for charging. It also comes with a built in LED reading light that charges from the cover’s reserve battery. The e-ink Kindles already have an impressive battery life that holds charge for up to two months. Battery life depends on several factors though. First off, avid readers will obviously use up battery more quickly than those who don’t read as often. Kindle games also take up a chunk of battery life, and so does browsing the Kindle Store. The reserve battery that is built into the cover charges in sunlight. The amount of time it takes to charge depends on the strength of the sunlight that it catches. It reaches full charge after 8 hours, and provides up to three days of reading per hour of charge according to the product’s website. The protective nature of the cover and the built in light are what wins me over. I travel a lot at night, and would like to find a cover the includes as much functionality as possible for the most reasonable price. 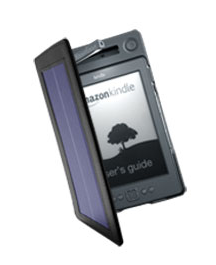 The Solar powered Kindle cover is $79. As far as cases go, it is on the higher side, but I think it is a really good value for what it does. This is the first portable solar powered charging device that I’ve seen hit the major tech news. I hope that the future will bring more solar powered and other energy friendly charging options. It would be cool to have a multipurpose docking station to charge all of my gadgets. What a great way to save money and help the environment at the same time. Thinking even further ahead, electronic devices will most likely include their own solar panels so that they can charge themselves. Because of cost, this is still a few years off at least. From what it looks like now, the SolarKindle Cover is only available on the SolarFocus website. I’m sure it will be offered on Amazon at some point soon.